SEG strives to build connections between students and community members to help break the cycle of poverty. For several months, SEG has been planning a new project to further this cause: credit-building loans. An individual’s credit score can have important impacts on their ability to secure loans, employment, or even housing, and credit-building loans can improve a limited or damaged credit history. In June, the Consumer Bankers Association and Ashoka’s Youth Venture hosted a national contest, Banking on Youth, in which teams of young people competed for seed money for their creative projects. 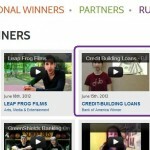 This contest presented an opportunity for SEG to compete for funds to start the credit-building loan project. At the end of June, the regional winners were announced, and SEG was among the winners in region 2! SEG is very excited to open this new chapter in our future!